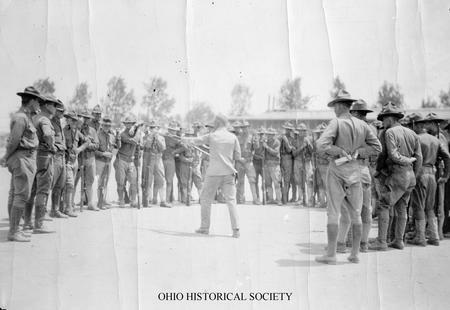 An image of a bayonet class at Camp Sherman, June 19, 1918, Chillicothe, Ohio. When the United States entered the First World War in April 1917, the nation was not fully prepared for the war effort. As a result, the government scrambled to create a system for training troops. Camp Sherman, located near Chillicothe, Ohio, was one of the new training camps. Ultimately, Camp Sherman became the third largest camp in the nation during the war. The camp was named after famous Ohioan and Civil War general William Tecumseh Sherman. Construction began in July 1917, and the first recruits arrived in September. Before World War I ended, more than forty thousand soldiers had received training at Camp Sherman. The camp was eventually home to four different divisions: the 83rd, the 84th, the 95th, and the 96th. The war actually ended before the 95th and 96th were ready to go overseas. The camp was built on top of Hopewell American Indian mounds in the area. Some of these mounds had been destroyed by agriculture over time, but others were bulldozed to make way for the 1,370 buildings constructed at Camp Sherman. The camp was organized like a small city. In addition to barracks and offices used by the soldiers, there were theaters, a hospital, a library, a farm, and a German Prisoner of War camp. German POWs remained at Camp Sherman until September 1919, several months after the war had ended. There was also a railroad system, and the camp had its own utilities system. Camp Sherman had a significant effect on nearby Chillicothe. It provided employment for many of the community's residents and housed many soldiers' families. Local businesses experienced significant increases in revenue because of the influx of population into the area. In addition, the people of Chillicothe tried to improve soldiers' morale by offering entertainments and hosting soldiers for dinners at their homes. In 1918, the influenza epidemic arrived at Camp Sherman. Thousands of soldiers contracted Spanish influenza in the late summer and early fall, and nearly twelve hundred died from the illness. Although the community of Chillicothe was quarantined to prevent the spread of the epidemic, some people outside of the camp still became ill and died of the disease. When the war ended, the camp temporarily functioned as a trades school to educate veterans so that they were qualified for jobs. A hospital for veterans was also established. During the 1920s, the United States government closed Camp Sherman and ultimately dismantled it. Today, none of the original buildings still stand. The land originally occupied by Camp Sherman now has a number of uses. It is home to the Veterans Administration Medical Center, the Ross Correctional Institution, the Hopewell Culture National Historical Park, a wildlife refuge, and the Chillicothe Correctional Institution.